Students will construct ramps of different heights and measure the distance traveled from the top of the ramps by Toobeez spheres to understand potential and kinetic energy. 2. Each team should build a ramp of equal length but varying heights using the rectangular frames with different lengths of Toobeez as support pieces. 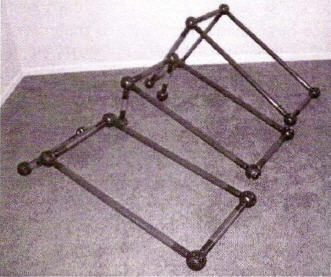 Team One: Use two 24″Toobeez tubes for the ramp’s height and one16″Toobeez tube as a bottom cross piece for support. 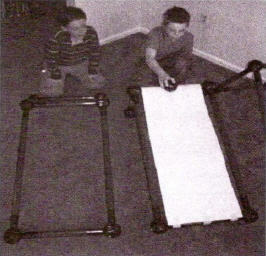 Team Two: Use two 11″Toobeez tubes for the ramp’s height. Team Three: Use two 11″Toobeez tubes forthe ramp’s height, but position them in the spheres in away that makes the ramp lower than Team Two’s ramp. The models are examples of the teams’ ramps. From left to right, Team 3, Team 2 and Team I are pictured. Teacher Note: Tubes for the varying heights will not always be perfectly perpendicular to the floor. 3. Have each team securely attach butcher paper to the top cross piece of each ramp with masking tape and run the paper down the length of the ramp to the other cross piece. 4. Attach the bottom of the butcher paper securely to the floor, not to the bottom cross piece. Make sure the butcher paper is tight and forms a smooth surface from the top to the floor. 1. Provide each team with one copy of the Measurement Recording Sheet or have them create one of their own. Challenge: Students will construct ramps of different heights and measure the distance traveled from the top of the ramps by Toobeez spheres to understand potential and kinetic energy. 3. Each team should have one member hold a Toobeez sphere at the top of their ramp and release it so that it rolls down the center of the ramp. 4. Using the meter stick or measuring tape, have another team member measure the distance the sphere rolled. A third team member should record the result on their Measurement Recording Sheet. 5. Once each team has completed four roll sand recorded their results, have them determine the average distance rolled by the spheres on each ramp. 6. Tape the Measurement Recording Sheet from each ramp to the top of the corresponding ramp so all students can see the average from each ramp. How did changes in ramp height affect the distance rolled? What type of energy did the sphere have at the top of the ramp? 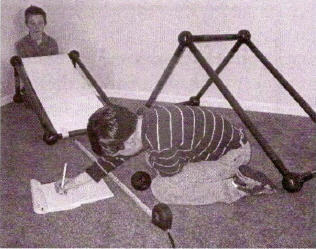 What type of energy did the sphere have while rolling down the ramp? Why where multiple measurements made for each ramp? Provide each team with a new Measurement Recording Sheet and assign each team a different ramp and conduct the activity again. Discuss the importance of reproducing results in scientific experiments. Have students experiment with constructing ramps with other lengths and heights. 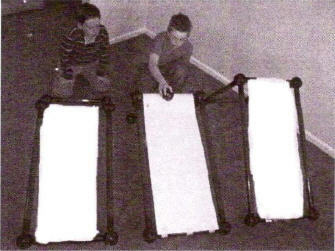 Instruct them to speculate what the results might be before conducting the experiments.